The second-generation owners of Laboratory Testing Inc. have been hard at work settiing up family governance policies and structures more commonly found in large, later-generation family firms. At Laboratory Testing Inc., an independent testing company in Hatfield, Pa., steel, iron and other materials get pushed, pulled, dropped, squeezed, stretched, smashed, dissolved and shattered. LTI's reports advise clients on whether the materials will remain intact when they are used in aircraft, building, medical or military applications. While LTI's employees are busy breaking things apart, the company's owners, siblings Mike and Joan McVaugh, are committed to keeping the family stakeholder group together. "If you communicate, it keeps people out of trouble," says Mike McVaugh, the company president. "If you don't, people assume things." Communication—among family members, management and employees—has helped LTI to grow and succeed. Even though the company is relatively small (it has 144 employees) and is still in its second generation of ownership, the McVaughs have set up governance structures and family policies as meticulous as those in place at sprawling later-generation firms with thousands of employees and dozens of owners. 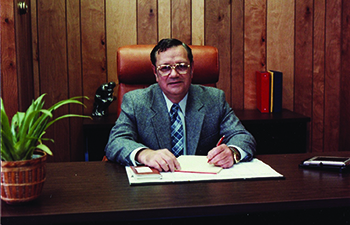 Mike, who has been with the company since its inception in 1984, became president of the company when the siblings' father, Robert W. McVaugh Sr., died ten years later in 1994. Joan joined in 1998 as finance manager and soon became part-owner. She now is transitioning from the finance manager to chair of the family council, with the title of "Family Relationship Officer." Mike, as president, holds 60% of the company shares, and Joan holds 40%. Not everything that comes into LTI gets destroyed. The company's facilities span 91,500 square feet across three buildings in a business park in Hatfield, about 35 miles northwest of Philadelphia. The main building, at 66,000 square feet, has a large area dedicated to non-destructive testing, which was the company's original focus and where Mike got his start as manager. A recent visitor to the company saw a technician patiently running an ultrasound machine over giant metal plates to ensure the material contained no microscopic flaws. The destructive testing area can be noisy. Periodic loud bangs signal that a material has hit its breaking point. Workers in protective gear operate a variety of machines and computers, ranging from small desktop meters that track chemical corrosion to large pulleys that stretch materials apart, to a giant press that stands more than 10 feet tall and weighs hundreds of tons. The press has its own room to keep workers safe from flying debris. Tests are observed through a special shatterproof window; workers measure how much time and effort is required to break the material. Two adjacent buildings, called LTI South and LTI East—12,000 and 13,500 square feet, respectively—contain smaller testing equipment for magnetic particle and corrosion testing. LTI also tests the testing equipment. The company's metrology division, in its LTI East building, is an accredited facility dedicated to calibration, where clients can send their own measuring tools and instruments to ensure they are accurate. Mike calls this part of the business "the cold room." The area must be kept at an absolute constant of temperature, light and humidity, resulting in a room that's a little chilly. "Chilly"—if not "frozen"—is an apt description of the relationship between the owners of Laboratory Testing's predecessor company. Robert McVaugh Sr. was a metallurgist at SPS Technologies in Jenkintown, Pa., when he founded a lab called Metals Testing Company together with his brother, Ted, in 1962. The two brothers didn't get along, and after the original company was sold in 1976, they stopped speaking to each other, according to Joan. Growing up, Mike and Joan weren't aware of the friction between their father and their uncle. Mike, now 55, and Joan, 59, were young children when the first lab was founded. But they do recall when the two stopped speaking. To this day, Mike and Joan don't know what caused the brothers' falling out. After the rift, they lost contact with their uncle. Their father next partnered with a man named Frank Carson to start a company called Carson NDT, a division of Carson Helicopters. Robert McVaugh, who started with a 10% ownership stake, bought the remaining 90% from Carson in 1984 and renamed the business Laboratory Testing Inc. Carson's helicopter company remains a customer of LTI. Though Mike and Joan don't know why their father and uncle stopped speaking, they know they don't want to repeat the pattern or have toxic feelings poison the company or the next generation. The key, they realize, is transparency. "We operate on the open-book concept," says Mike. "Everything is very transparent. We even share finance information with all our employees." Third-generation McVaughs working in the business include Mike's sons Brandon, 32, and Brad, 27, and Joan's son Mike Hiller, 33. Mike's daughter, Brittany McVaugh Lukens, 30, used to work in the human resources department and now is a stay-at-home mother; her husband, Nick Lukens, 32, works at LTI, as does Mike Hiller's wife, Angela, 34. Mike's son Bryan McVaugh, 24, is employed at UBS, the global financial services firm, in New York City. Joan's son Christopher Hiller, 32, was an IT specialist in the Navy and now works for a digital marketing contractor to global pharmaceutical firm Merck. Mike and Joan McVaugh have two brothers, Rob (Robert McVaugh Jr.) and Tom McVaugh, who both worked at LTI in the past. Rob left for a career in the insurance industry and Tom moved to Rochester, N.Y., to pursue a variety of other business interests. Rob's son and daughter both have worked at LTI during college summers—his son, Austin McVaugh, currently works at the company part-time—and his stepdaughter also has worked in the business. Tom's children have worked at the company from time to time, as well. Mike and Joan created a family council in 2010 and an advisory board in 2007. The council meets at least quarterly; the advisory board convenes five times per year. The council consists of Mike, Joan and their six children. All are voting members. The family council doesn't make major business decisions; that's the role of the advisory board. Council meetings focus on ownership decisions, family education, philanthropy and the like. "This is really about preparing the next generation to become future shareholders," says Joan. "We know many family businesses don't survive the transition from G2 to G3. A family council ups the odds of surviving the transition from second to third generation." LTI's advisory board, meanwhile, helps the owners with business and policy matters. Three senior business executives from the community serve on the advisory board. Lee Delp, the chairman, has a background in manufacturing and insurance; Paul Litwack has experience in both manufacturing and finance; and John Gallagher's area of expertise is manufacturing operations. An HR consultant, Karl Buehler, also works with the advisory board to address compensation and hiring issues. "The reason we're so successful is that we treat [the advisory board] like a fiduciary board," says Mike. "We take their advice seriously and act on it," adds Joan. Key non-family members, such as CFO adviser Loretta Tubiello-Harr, are brought into advisory board meetings, and third-generation McVaughs—including some who aren't working at LTI—participate as observers. Some board meetings are open to spouses as well. Mike and Joan McVaugh say they have never had a major disagreement. The first step in their dispute resolution plan is to consult the outside advisory board. If the board can't help them settle the issue, both siblings acknowledge that Mike, as 60% owner, would have the final say. Such a situation has not arisen, they note. Family members and key LTI managers attend many courses and conferences on family business and leadership development. Networking with peers from other companies and sharing strategies for addressing challenges is valuable, family members say. "It doesn't matter the size of the business; everyone goes through the same struggles," notes Mike Hiller. "It's a really good to hear businesses at a forum that are going through what we are," adds his cousin Brandon McVaugh. "We value our relationship as cousins as well as colleagues, and a lot of that began because we go to these meetings." The McVaughs instituted a family employment policy in 2004 and revised it in 2009. Since then, there have been a few minor wording changes, but no major revisions, says Joan. All changes were shown to the third-generation members before they were implemented. Under the policy, next-generation family members who desire a career at LTI must first work somewhere else for five years. The five-year rule doesn't apply to summer jobs during school, which all of the third generation have had. The five years needn't be spent working in a related field, but during those years, the family member must demonstrate success, get promoted and show professional development. Military service also counts toward the five-year requirement. Even after five years somewhere else, employment at LTI isn't guaranteed. A family member must apply for a job and be interviewed by the advisory board. In addition, there must be an appropriate open position—a job won't be created for a family member. And if a better-qualified non-family member applied for the same position as a family member, the most qualified candidate would get the job, Joan says. LTI's advisory board reviews family employment applications together with Karl Buehler. The family council also gets involved in family member hiring decisions. It hasn't happened yet, but should there be a reason not to hire the family member, the objective opinion of the non-family members would take the burden off the family, Joan notes. Brandon McVaugh worked at financial giant Vanguard for five years before joining the company, while Brad McVaugh worked for Baum Precision, a family-owned machine shop in Pipersville, Pa. Mike Hiller was a teacher and then briefly ran a restaurant his father had bought. "It was a pizza shop, which meant a lot of long hours and weekends," Hiller says. "I learned a lot, and I learned what not to do." At LTI, Hiller is in charge of marketing and new business development. Brad McVaugh, sales supervisor, is in charge of customer services, such as providing quotes and making sure jobs are delivered on time. Brandon McVaugh is the manager of the machine testing and machine service department. "I spent ten or 12 summers in the lab, so I have a pretty good feel of what to do," he says. His role is overall operations, while the technical staff handles the fixing and servicing. Brittany McVaugh Lukens's husband, Nick Lukens, is a facilities supervisor at LTI, and Mike Hiller's wife, Angela Hiller, works in the company's human resources department. Mike McVaugh is firm about the employment rules, and says none of the next-generation members ever objected to them. "We educate early that there's no entitlement," Mike says. The only deviation from the five-year rule was the incident that taught Mike and Joan a valuable lesson about communication, they say. One of the non-family managers had worked with Matt McVaugh, the son of their brother Tom, during Matt's summer stints at LTI. The manager wanted to hire Matt full-time. Though the family five-year policy was in place, Mike and Joan had never communicated it to non-family managers. They agreed to allow Matt to accept the full-time job offer, but the experience taught the family what happens when someone is out of the loop. Matt now works for a nearby water treatment plant, but he has come back to help out at LTI during busy times. Four times in the last ten years, LTI has been named to the list of Best Places to Work in Pennsylvania. In 2011, the company received an honorable mention from the "Philadelphia 100" award program, which recognizes the fastest-growing private companies in the Greater Philadelphia region. In 2012 and 2013, LTI was named one of the Greater Lehigh Valley's fastest-growing companies. Revenues have increased from nearly $7.7 million in 2003 to $17 million in 2013. The average tenure of an LTI employee is 12 to 14 years—almost half the life of the company. The company promotes from within wherever possible, and Mike McVaugh says a large percentage of supervisors and coordinators rose up through the ranks. Surpassing sales goals can bring big rewards; the company has taken its employees and their spouses on a Bermuda cruise and a vacation in Punta Cana in the Dominican Republic. The trips are open to all, and all are encouraged to go for the team bonding experience. "We want everyone to go and be together," Mike McVaugh says. Employee input is encouraged and acted upon, the McVaughs say. In fact, a team of employee coordinators is tasked with suggesting ideas to improve processes and save money. And last year, the winner of the company's annual Innovation Award received two weeks' pay for an idea that saved both time and money. The company's incentive program includes a performance bonus based on meeting both company and personal goals as well as a profit-sharing program. Mike and Joan McVaugh have no immediate plans to retire, but they've started a transition plan for when that time comes. "It's important for the employees to know the business will continue; that it will go from second to third generation," Joan says. "Employees love security, to know you're not going to bail and sell." Despite the McVaughs' intention to keep LTI in the family, Mike says they continually receive offers to buy the company. "It's crazy—we get e-mails, voicemails, et cetera," he says. "But we are so crystal clear on the direction of the company: we want to continue as a family business." In June, LTI celebrated its 30-year anniversary. "We certainly hope to be here another 30 years," says Joan. Hedda T. Schupak is an editor and analyst specializing in fine jewelry and luxury retailing. She is the editor of The Centurion Newsletter, a weekly e-news magazine in the luxury fine jewelry industry. 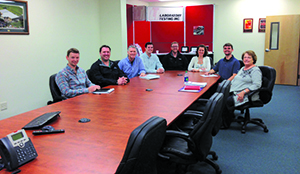 Every action taken at Laboraory Testing Inc. is governed by five family values, according to the company’s owners, siblings Joan and Mike McVaugh. 1. People: We treat everyone like family, with dignity, fairness, and respect. 2. Integrity: We report accurate and reliable test results and maintain honest and open communication, while holding ourselves accountable for our actions and responsibilities. 3. Leadership: We expect everyone to be a leader in their area of responsibility, as we work together toward common goals. 4. Learning: We support each other in lifelong learning and self-development through education reimbursement, seminars, cross-training and professional development. 5. Profits: We work hard to achieve our goals so everyone can share the profits, together with fair compensation, profit sharing and competitive benefits. We support our community and reinvest in our company with new equipment and technology to keep us competitive into the future. For example, as part of LTI’s commitment to integrity, all financials are available or any employee to see, and as part of its commitment to learning, the company will reimburse 85% of the cost of college tuition for any employee who maintains a B average or better in a field related to his or her job. “We work hard so we can give back and keep the business going into the future to keep giving back,” says Joan.